What could be more delightful than a bone-chillingly dreary day? Why, experiencing the joy of nature on such a lovely day, of course! Playing basketball outside in freezing temperatures! With a child whose blatant disregard for my well-being has not gone unnoticed by yours truly. Did I mention it was astonishingly windy, too? When there’s finally the teeniest ray of sun poking through the foreboding clouds right before the sun sets, it’s obviously time to wander outside into the frigid air. Nevermind the fact that it’s chilly enough to guarantee Frosty the Snowman at least one more day of puddle-free existence. Oh, and thank you, Daylight Savings Time. Your highly anticipated return has provided this wonderful extra hour of daylight. Except after a long day, when I’d like nothing more than to convince the kids that the dark sky means it’s clearly time for bed. Somebody, please tell me why it’s so difficult to force a child to go outside and play on a gorgeous sunny day? Wouldn’t that be far less painful for everyone? I guess this must beat shower time. My child seems genuinely intrigued. So I stuck my hand up his shirt. My freezing cold, bluish-purple hands. Let me tell ya, cold is a very powerful motivator. I shot far more hoops than usual that day. Bouncing and hopping around like a maniac in a desperate attempt to generate my own heat before succumbing to imminent hypothermia. Which, evidently, is not a concern for crazy children. Their sheer insanity keeps them sufficiently warm. It was a surprisingly invigorating outing. I remember shooting at many frozen nets in my time. My mother tried to keep me inside but that wasn’t gonna happen. She wasn’t inclined to leave the warmth of the house to join me…but she did ensure making shots would be more difficult by wrapping me in multiple layers of clothing. She probably figured if she made making baskets challenging I’d come to my senses quicker…and would be as warm as possible while drawing that conclusion. Daylight Savings Time is indeed one of the most evil and stupid things ever created. Hate it! Are you sure your kids don’t live on my street? 8 PM seems to be their favorite time to play basketball in the street…. even on days when it’s about 20 degrees like it was last week. I have to listen to BOUNCE, BOUNCE, BOUNCE while I’m trying to relax! You gotta have a love for basketball to go out in the cold to throw hoops. Ha. 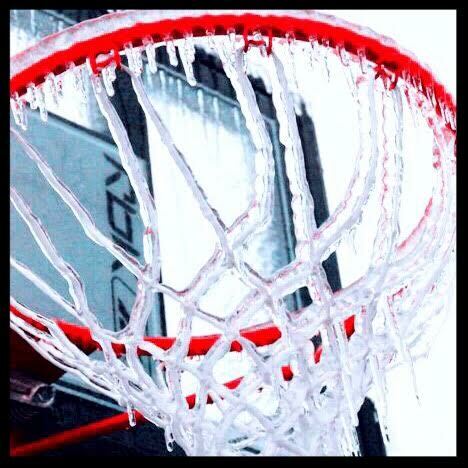 March Madness with a frozen net. Nice! Super funny. I thought you were kidding about the iced net until I scrolled down the page. Have a wonderful weekend and happy St Patrick’s day! I’m in a class this weekend for coaching! Please send your light and happy vibes my way (thank you). Your post left me smiling on a windy and very rainy winter afternoon, your words transport one right to that icicle laden basketball net!